I discovered D&D during the launch of 3rd Edition. It wasn’t my first RPG but I instantly fell in love with it. The setting, the classic nature of it, the D20 system in all its glory. I was a player when I was first introduced to the game but I started thinking about my own adventures and where I could take players. I played a lot during 3rd Edition and 3.5. I ran several adventures and played in dozens more. I loved the flexibility the system offered and the sheer range of play styles it offered. The Dungeon Master’s Handbook was an invaluable tool to a young writer. It taught me about story structure and how to craft situations and narrative. DM’ing gave me a chance to practice a lot of skills I would later come to rely on in my professional career. 4th Edition I missed completely. I was studying at university at the time, and focusing on other things. I had also moved away from my usual play groups and so other hobbies filled the void quicker. The game was always in my mind, but it wasn’t until recently that I entered the Forgotten Realms once again. I had been watching the development of 5th Edition with great interest. I was running a Dark Heresy 2nd Edition campaign at the time of its release, so I didn’t get into it straight away. I heard lots of good things from the community and I am impressed by the level of support Wizards introduced with the new system. With my current campaigns all wrapped up, I decided it was time to jump back in and see what the fuss was all about. I think one of the main things that got me to revisit D&D was the sheer amount of videos on the internet that us the system. I’ve spent most of my time over the past few months watching shows like Force Grey, Dice Camera Action, Critical Role, and Heroes & Halfwits. I’ll put links at the bottom for them. These shows are fantastic to watch. I like them as both pure entertainment, but also as learning tools. Watching people like Matt Mercer, and Chris Perkins DM is insightful. They DM with a confidence and skill I can only dream to one day achieve. 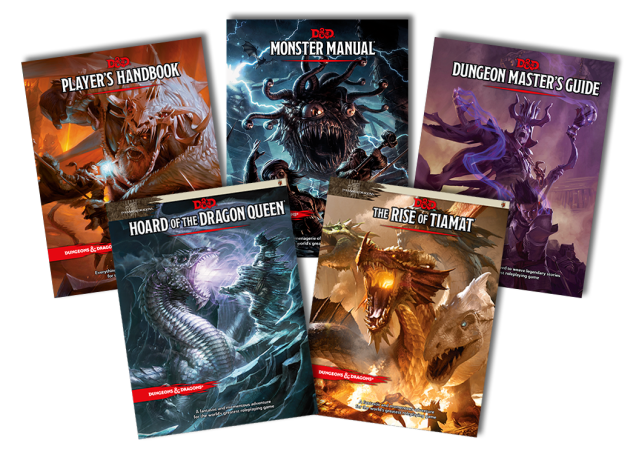 There’s also the support of online role-playing that has been introduced with 5th Edition. Wizards recently struck a deal with Roll20, an online RPG app that allows groups to play adventures together through the internet. The site will be releasing exclusive D&D content for people to use on Roll20 in their online campaigns. There is just a wealth of support material out there for D&D right now. There’s a digital magazine which is always full of interesting articles and stories. There’s a podcast that talks about upcoming content and interviews people from the community. There’s a website called DMSGuild, where people can upload content for other players to download and use. The best thing about the site is that content creators can choose to charge for their work and it’s all approved by Wizards. They even highlight community favorites and encourage people to support the independent creators. It feels like the most supported RPG system out there and that fact helped pull me back in. I feel like it’s also worth mentioning the new books. They are gorgeous hardbacks, full color, with beautiful art work, and a great finish. They’re some of the prettiest RPG source books I think I’ve ever owned. There is something fundamentally honest about D&D. It comes from a simpler time; from the birth of modern day gaming. Its influence can be felt everywhere. You only have to look at a modern video games, like Dragon Age Inquisition, or Pillars of Eternity to realize that the influence of D&D is alive and well. 5th Edition feels to me like the game D&D was always meant to be in a position on the market that it always deserved to hold. It’s fast, it’s fun, it’s easy to get into, and it’s as deep as your group want it to be. The support for it is incredible, as is the continuing story line they are using to theme the products, and supplements. Older editions of the game were always about giving you and your friends a rules set to craft your own adventures. 5th Edition has that, but it also has much more. It has plenty of supplements, a story line, a shared universe to work in, and talented fans producing more content than you can use. I came back to D&D expecting it to feel familiar, but the truth is that it feels like so much more now. It feels like a game we all share together no matter where we are. It feels like it connects us in some way; a way that previous editions failed to capture. It hits the heart of what a role-playing game should be and it does it in exciting, new ways. I want to be a part of this community and to create content that other people enjoy in their own games.